The newlywed Linda Chung (鍾嘉欣) is still on her break, but she did not forget to promote her latest album Under the Stars <星空愛情>, which officially releases to stores on Tuesday, April 12. The album, a compilation of Linda’s music from 2006 to 2016, includes nine new songs and seven older songs that were already recorded in her previous albums. Though Linda has yet to officially announce her pregnancy, Linda’s low profile and sudden hiatus are signs that the actress should be at least five months pregnant. 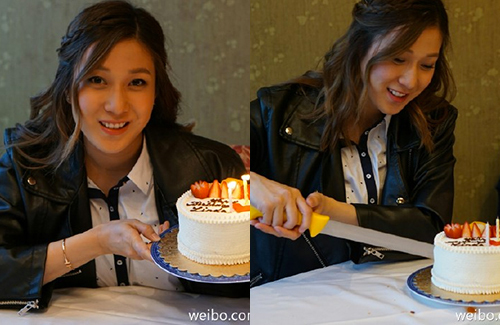 The “Everlasting Heart” <一顆不變的心> singer, who is currently residing in her hometown Vancouver, had her 32nd birthday on April 9. She went on social media to express her gratitude to fans and friends, sharing some pictures she took at her small birthday party. Linda did not mention a baby in her message, but in her photos, it looks like she was deliberately trying to hide her protruding belly. Ahh she looks good. Def. looks pregnant but very blissful looking! Happy for her.